Money is everywhere and is needed in order to do practically anything in life. Though this much is clear, what isn’t as widely known is how much it actually costs to print the money that everyone uses. How much does it really cost to print a dollar or five dollar bill? The following will provide an answer to this question and will also take a look at who exactly prints money and how that printed money gets into circulation. To first understand how much it costs to print money, it’s important to take a look at who actually prints money in the first place. On that front, the Treasury Department of the United States government prints both coins and banknotes that are put into circulation. 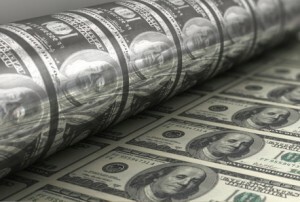 All paper money that is printed is done so by the Bureau of Engraving and Printing, a department within the Treasury. The US Mint is the portion of the Treasury that prints coins and puts them into circulation as well. The cost of printing money varies dramatically and all depends upon the type of banknote being printed. Every year, the Federal Reserve will ask for a particular amount of money from the Treasury. They place an order with them based upon their calculations and projections for how much money will be needed in the coming year. When it comes to banknotes, the cost of production for each bill is significantly lower than how much the bill is actually worth. Both the $1 and $2 notes cost exactly 4.9 cents per note to produce. These costs only raise slightly for higher denominations. The $5 note costs around 10.9 cents per note to produce. The $10, $20 and $50 notes all cost less to produce than the $5 note, likely due to demand. The $10 note currently costs 10.3 cents per note to produce, while both the $20 and $50 notes cost 10.5 cents per note to produce. The $100 note costs a bit more than the rest to produce, arriving at 12.3 cents per note. These rates can change every year. When it comes to the coins that are produced, it’s important to note that the US Mint is provided with monthly orders as a means of doling out how much they are going to print. Unlike their banknote counterparts, coins are bought by the Federal Reserve at face value. For example, a quarter costs exactly 25 cents to produce per coin. The reason that the coin cost is relatively higher than the dollar is due to the fact that notes are comprised of paper and thus are much less costly to produce, while coins are comprised of metals. How Does Printed Money Get Into Circulation? There are a couple things that should be mentioned before describing how printed money gets into circulation. First, there is currently over $1 trillion in circulation today, the majority of which is outside of the U.S. Once the money has been printed by the Treasury, the Federal Reserve will order some, which will then be shipped to them. Once this has been completed, the money is then shipped to banks throughout the United States. This is done in order to meet the demand of the consumers. However, if demand is met and the banks have too much money, there are times when they will deposit it back with the Federal Reserve. There are currently 12 Federal Reserve banks throughout the nation which the money is sent to and from. Once it has reached the banks, it then goes into the consumers’ hands and is officially put into circulation. Surprisingly enough, banknotes have a small lifetime once in circulation. For instance, the $1 note has a average life expectancy of 5-9 years, while the $100 note has one of just 15 years.